Last weekend, I took something of a holiday. Well, something more of a ‘virtual’ holiday. 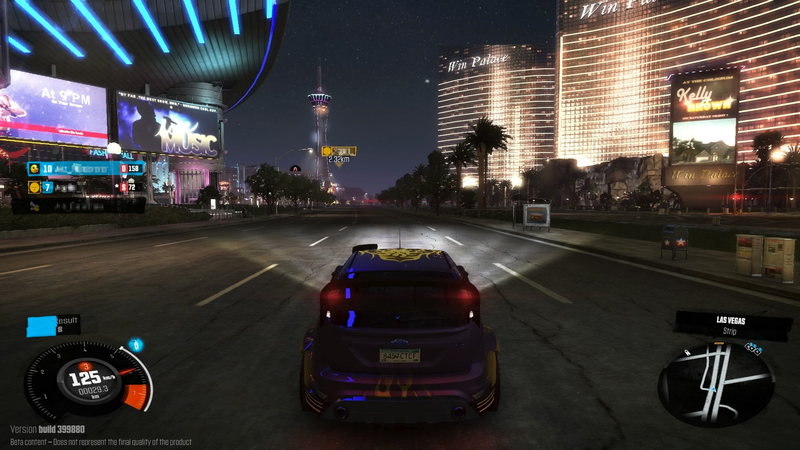 After receiving a code from Ubisoft for Ivory Tower’s The Crew, I must say that I wasn’t really expecting much. Instead I got something far greater than I expected, something I had no idea I wanted, and something that I have just pre-ordered. After launching The Crew, I was thrown straight into a car chase with the police, whom pushed me cross-country, all the while battering me and my formerly shiny, now very scratched pickup truck. I don’t even know what I did. The story then decided to intrude and lucky me; the protagonist shares my name. ‘That’s not so bad’ I hear you say. It wouldn’t be so bad if they didn’t state his name every 10 seconds, which got very old very quickly. It’ll get on your nerves; you can only imagine what it did to mine. So our protagonist Alex, played by Troy Baker (TLOU, InFamous Second Son, Bioshock Infinite), manages to escape the clutches of the long arm of the law. Immediately afterwards however, we get led by the nose into Detroit to take part in a street race. It’s at this point I realise the game plays in a very similar way to Rockstar’s Midnight Club series, whilst not a complete put off, it’s a little jarring after 6 years of market trends of every game trying to be Gran Turismo or Forza. Once in Detroit, we meet up with Alex’s brother, whose name I don’t even recall since he died within 30 seconds of the race ending; there wasn’t really any particular impact here. So with his brother dead, and captured by the police, we skip forward 5 years, once again take control of Alex and the real meat of the game begins. The story here isn’t really that interesting or engrossing. The characters are pretty bland and irritating since they never have the decency to shut up, but let me tell you why that is completely fine. Whilst not exactly great, the story in this game basically frames the gameplay, and it does a good job of it, it gives a sense of agency whilst retaining urgency. However, this is not any reason that you want this game. You want this game for the world it takes place in. 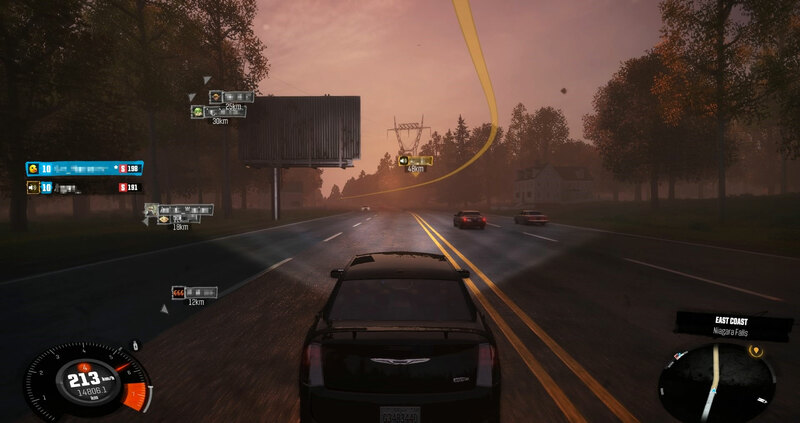 The game world to The Crew is an approximation of the United States of America. Believe me when I tell you that this game is absolutely enormous. At a size of 1900 square miles, it may well be one of the largest game worlds ever created, and it is absolutely marvellous. It’ll take you over an hour to get from one end of the map to the other, but by no means is it boring. The amount of choice you have; from whether you want to go by highway, country roads, dirt tracks, or off-road, The Crew allows you to do it all, and it opens up pretty quickly. As soon as you finish the prologue, the entire map is available to explore, from Las Vegas to Los Angeles, New York to Dallas, and even Salem to Roswell. Not even mentioning the stuff in-between. So with all that mentioned, let me tell begin to tell you a little story about how I and a friend travelled from Maine to Texas in our all-American muscle cars. 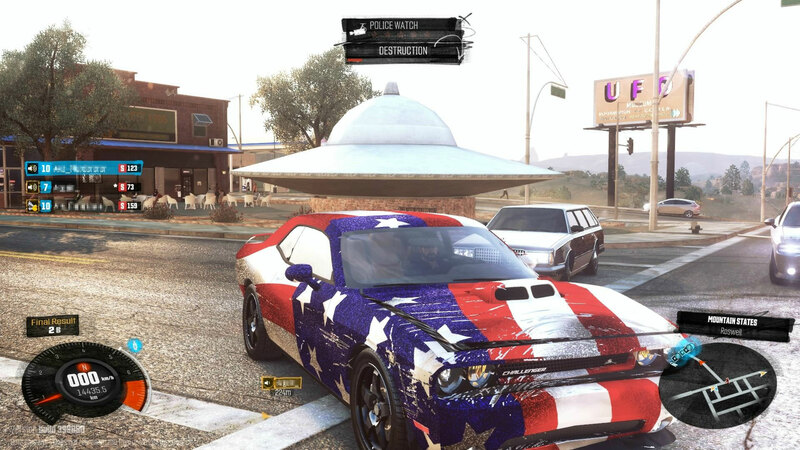 I decided to hook myself up with a Dodge Charger which I decided to paint with the star spangled banner, since I had suddenly decided I felt extremely patriotic. Whilst my friend decided to take a yellow Chevrolet because amusingly he had earlier stated “The only cars that look good in yellow are Chevvies, and that’s a fact.” I’m not sure I believed him before, but now I certainly do. A point to make about the tuning and customisation in this game, whilst not quite as in depth as something like Forza, it’s still very robust, though admittedly feels more like building a character in an RPG than tuning a car. The different kits you can buy really mix up the gameplay, as well as giving you something interesting to do. Want to make that Volkswagen Golf into a heavily armoured off-road beast? You can do that! Want to turn your pick-up truck into a performance model drag racer? Yes, you can do that! The amount of choice in this game is surprising, and it’s incredibly enjoyable just to see what you can come up with. Meanwhile, our road-trip begins. We make our way to New York, where we decide honking and hitting other cars whilst yelling obscenities has reached the top of our to do list, since we wanted to do our best to fit in. The cities in this game are incredibly well represented as a rule of thumb. They’re fairly sizable, and definitely feel like the real cities, but don’t expect to see everything in here. There are a few missing towns/cities/locations I personally would have liked to have seen, and I’m sure some others would agree with me. Truthfully though, the only thing more authentic than a road trip around America in The Crew would be nothing short of a road trip in the real life counterpart. With NYC out of the way, we begin to make our way to our next destination, the Florida Keys. Taking a trip through the south is a fairly interesting experience in and of itself. According to my travel buddy; a former resident, it’s a fairly accurate representation, most notably with gazebos every thirty metres and trees so southern that they grow beards. Across our journey, we drive over swamps, through forests, orange orchards, over beaches and last but not least, by road. After a solid 40 minutes after we set off, we finally reach the keys. We then decide to recruit a third person to our crew; a black, and very quick Ford Mustang. With our new friend in tow and the journey almost at an end, we push forward to our final destination, Dallas Texas. There’s not much really to say as we drive back through the rest of the south, reliving the familiar sights before the unmistakable golden yellow of the Great Plains come into view, a welcoming sight, before we reach the centre of Dallas. With our road trip finished and an hour racked up on our play time. We decide to just keep driving; the truth is we kept driving until the Beta ended. We explored, raced, cruised and we did a lot of it. This was the true experience of The Crew and it is something you will not get anywhere else. I don’t speak for anyone but myself, but I think this is one of the most unique driving games in years. 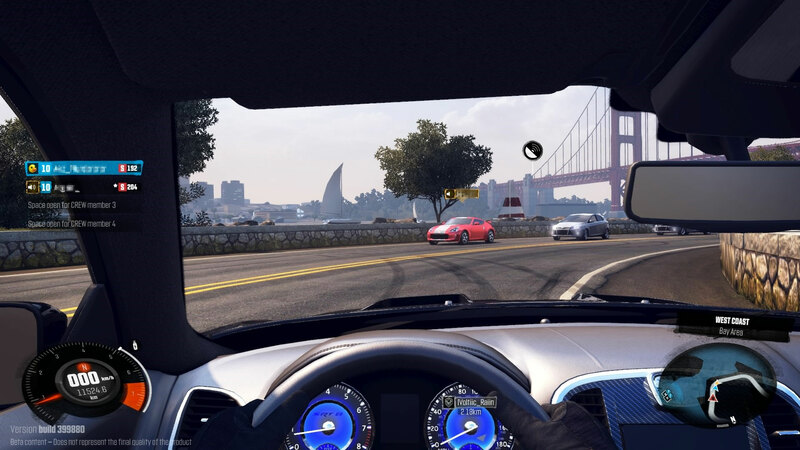 The writer of this article played The Crew Closed Beta on the PlayStation 4. The Crew releases December 2nd Worldwide.